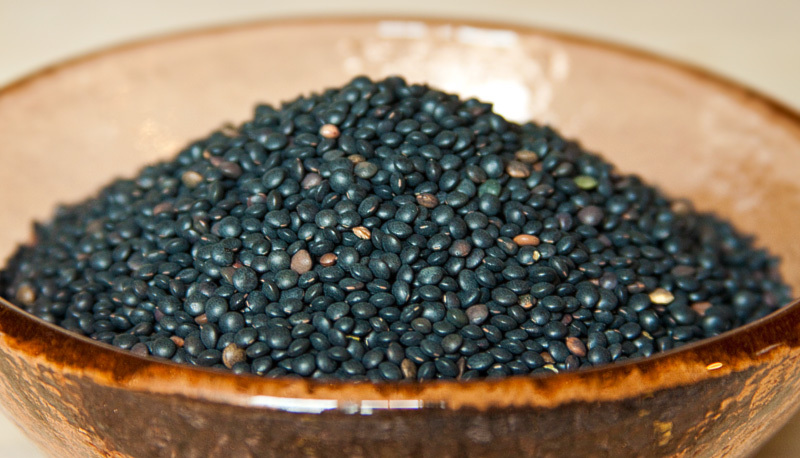 Black lentils, like French Green Lentils (lentilles du Puys), differ from other “garden variety” lentils in several ways. 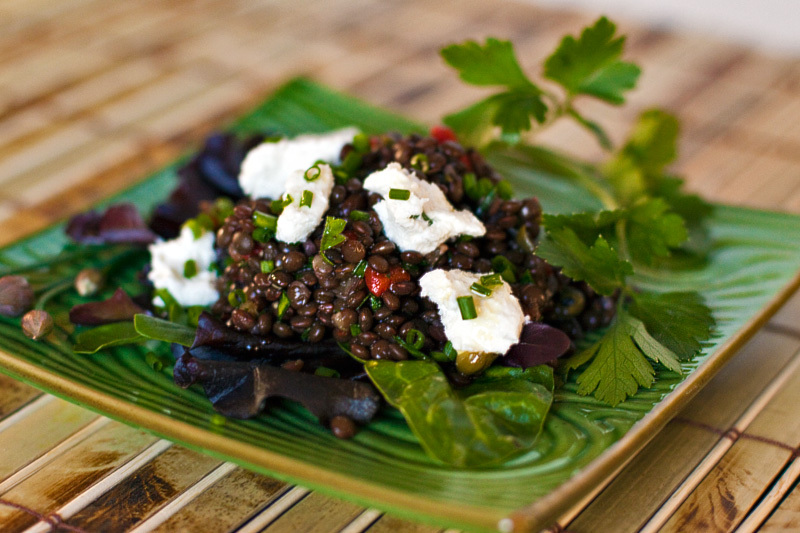 Black lentils retain their lens-like shape and firm pleasant texture when cooked, making them a good choice for salads. They’re much smaller, too – only about 1/8th-inch or so in diameter. Black lentils cook very quickly, requiring only about 15 – 20 minutes to cook to a pleasant ‘al dente’ consistency. The natural deep ebony color of black lentils fades to an attractive rich nut-brown hue during the cooking process. Their mild, but distinctive “legume” flavor melds beautifully with vinaigrettes and marinades, and accommodates itself well to soups and stews too. Versatile, flavorful and nutritious black lentils are a healthy, convenient choice for the modern, on-the-go lifestyle. 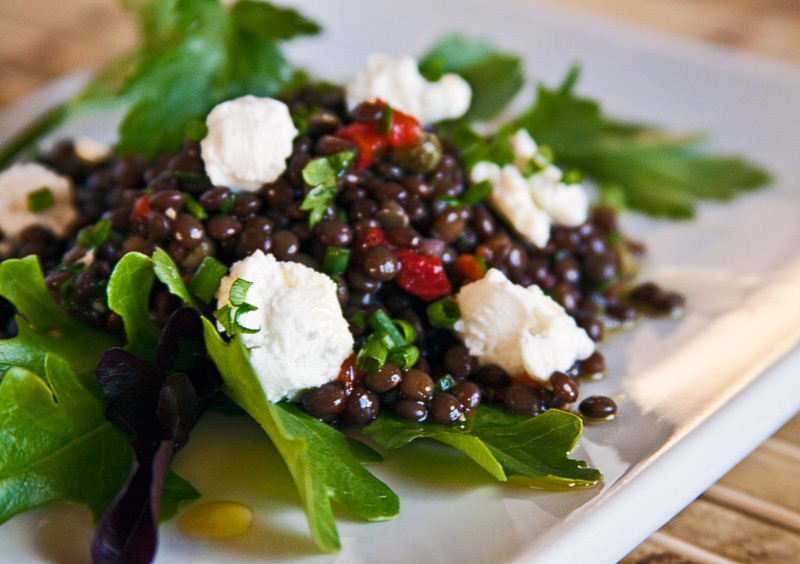 Easily prepared in advance, black lentil salad can be served up any way you like, from a hearty side dish to a light lunch or main dish. Perfect for cool & casual summer dining, or for the whole year round! Rinse the lentils and place them in a pot of 4 cups of boiling water. Simmer for 5 minutes and add the shallots. Simmer for an additonal 10 minutes or until tender, but with a little resistance “to the tooth”. Drain immediately through a fine strainer and rinse briefly with cool water. Drain again, set aside and allow to cool. In a large bowl, combine the cooled lentils with the olive oil, lemon juice, vinegar, sugar, salt and pepper. Add the capers, roasted pepper, parsley and chives and toss briefly. Arrange a small amount of salad greens on each plate and mound about a 1/4 cup of the lentil mixture on top of the greens. Crumble a little of the goat cheese over the lentils. Drizzle with a little additional olive oil and sprinkle with a few sliced chives. I’m not a big fan of lentils, however I am intrigued by this kind. I’ve not seen it in our local store. Thanks for sharing! This is just beautiful. I have been so jealous of all these black lentils in blogs, wondering where I can get my hands on them. Ahhh, duh, they are in my pantry- I bought them at the Indian store. Same thing? Right? I hope so. This was delicious and very easy to prepare! making this today! love black beluga lentils. i posted this on my blog today. Excellent – all flavors make a wonderful combination for a terrific summer salad! Loved it!